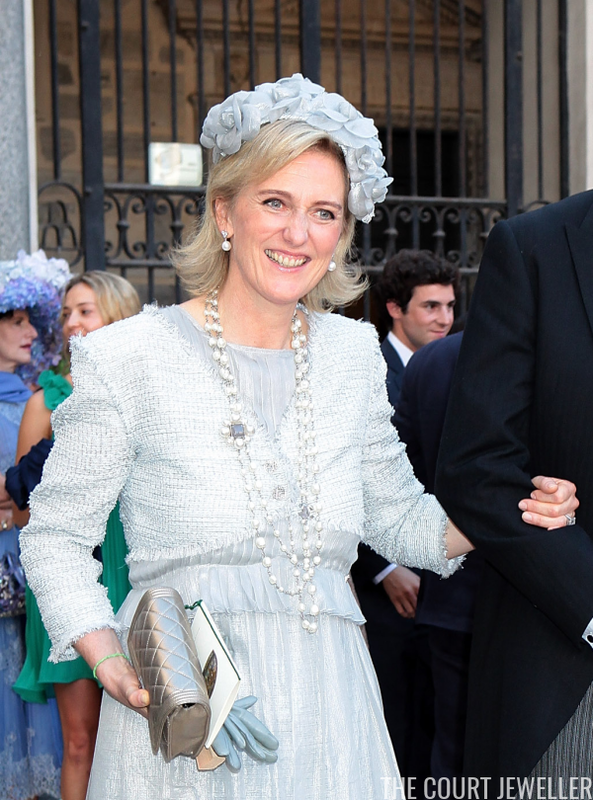 Our Magpie of the Month, Princess Astrid of Belgium, is a huge fan of Chanel. You'll often see her sporting clothes and handbags from the fashion house -- and, as we're discussing today, jewelry! Here's a closer look at one of her most eye-catching Chanel necklaces. 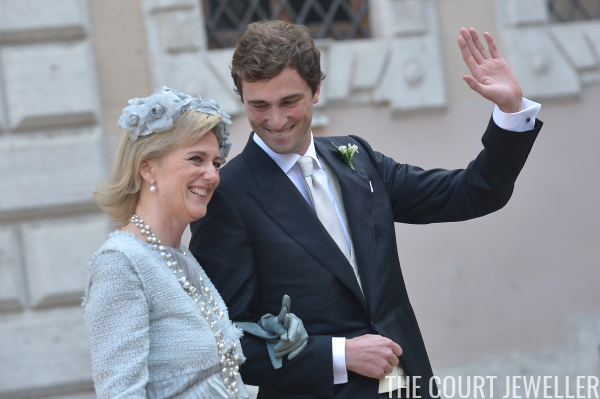 Astrid wore this long pearl station necklace, plus other clothing and accessories by Chanel, for the wedding of her elder son, Prince Amedeo, to Elisabetta Rosboch Von Wolkenstein at the Basilica Santa Maria in Trastevere in Rome in July 2014. You'll note that the necklace also features two more additional embellishments: the famous interlocking Cs that make up the brand's logo, as well as a brooch-like ornament that resembles a pearl cluster with a square central stone. 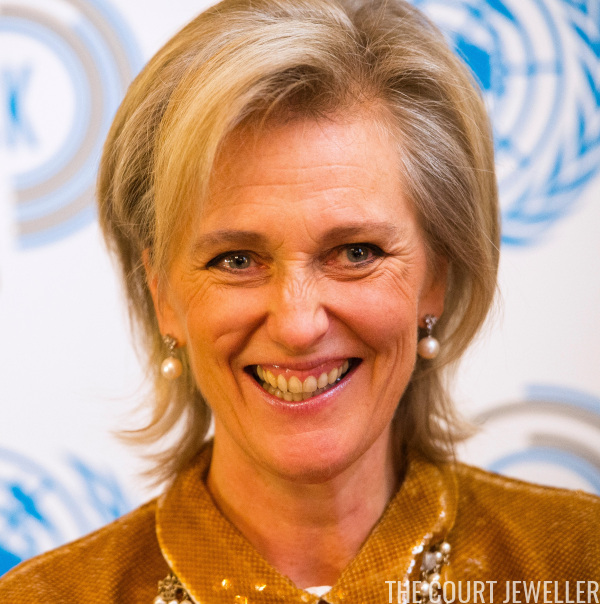 You can see the necklace peeking out of the collar of Astrid's jacket in this photo, taken at a UN reception in Brussels a year and a half later. She's also wearing the same pair of earrings, which she generally pairs with the necklace: a stud made of a trio of diamonds from which a pearl drop is suspended. 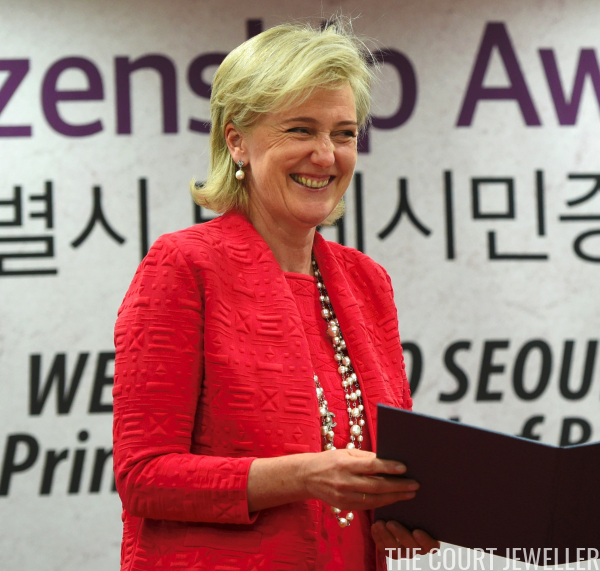 The earrings and necklace also made an appearance last summer in Seoul during Astrid's ten-day economic mission to South Korea. You can spot the Chanel logo peeking out of her jacket on her right side, and the brooch-like ornament positioned near her heart on her left side. 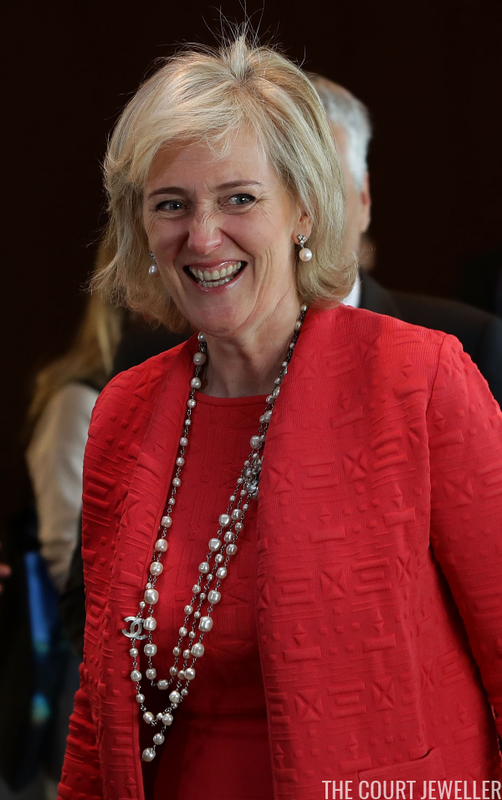 The long necklace appears to move with the wearer -- in this photograph, taken at a different event on the same day in South Korea, the brooch-like ornament has flipped, with the silver-toned back of the embellishment visible just under Astrid's jacket.